Jack Enlisted in the AIF on 14 October 1941 and was Discharged on 20 November 1945. Jack Neal was on New Britain from February 1945 until July 1945 and was involved in these operations. He was in 88 transport Platoon, 5th Australian Division (4th Brigade)in New Britain. Jack is the twelfth child of Stewart and Mary Neal(n.Bottcher). He was born on 29 July 1918 at Brown Street, St Peters, New South Wales, Australia. When Jack was about 11 years old, the family moved from Lakemba to 70 Belmore Rd Punchbowl New South Wales. On 5th May 1936 Jack enlisted in the Militia forces for a period of 3 years in 56 battalion of the 5th Brigade and was discharged on 5 may 1939. In January 1940, Compulsory Service was introduced for the Militia and during 1940/1941 the Militia was called up. Jack was recalled to 56 Battalion, a New South Wales Militia Unit on 16th Oct 1941. He enlisted in the 88 Transport Platoon, 56 Battalion and was in 2nd Division (14th Brigade)as a Cook. When the Pacific War started in December 1941, Militia members were prevented from joining the AIF (Australian Imperial Force) and all were called up for full-time service. 2nd Division was mobilised at Parramatta in Eastern Command. Its first role was in support of 1st Division in the defence of Sydney. On 19th October 1941 Jack Joined 14th Brigade, which was stationed at Gretta, New South Wales. 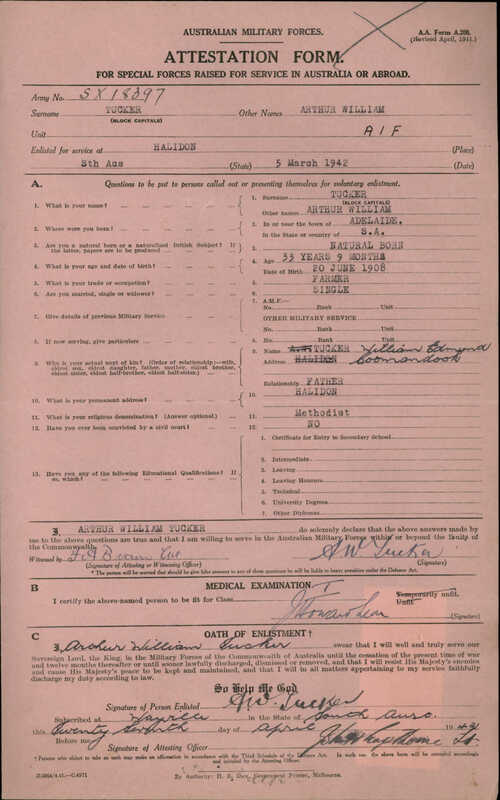 He remained in Gretta until he was transfered to Tamworth on 14th March 1942. On 7th December 1942 Jack was promoted to the rank of Acting Corporal. In late 1942 56th Battalion joined with 54th Battalion and became part of 5th Brigade which was stationed in the Bathurst, New South Wales Area. In April 1943 Jack was transfered the the School of Cookery at Cowra, New South Wales. He remained in Cowra until March 1944. Finally in March-April 1944 5th Brigade was moved to North Queensland to Prepare for operational deployment and HQ 2nd Division was disbanded in April 1944. On 9th December 1944, Jack rejoined 88 transport Platoon and upon the disbandment of 2nd Division was now attached to 4 Brigade 5th Division which was on active service in New Britain. On 19 February 1945 Jack boarded the troop ship Katoomba in Brisbane Queensland and Sailed for Jacquinot Bay in New Britain, arriving 5 days later, on the 24th February 1945. He remained in New Britain until the Hostilities ceased and returned to Australia on 28th July 1945. (see the attached extract of the 5th Australian Division's military operations in New Britain, of which Jack was apart of). On 4th December 1945, Jack was discharged from the Army after serving 1448 days in the service of our country during the Second World War. Jack married Dulcie Anderson, the daughter of Rupert and Clara Anderson on 10th Aug 1940 at Milperra, New South Wales, Australia. Their first two children were both born during the Second World, James (Jimmy) 26 Nov 1940 and Pauline 15 December 1943. They then had two sets of twins Judith and Patrick born 4 April 1946 and Robert and Kathlee born 17 June 1947. Because of the rarity of having two sets of twins in a row, a reporter from the Australian Women's Weekly came to their home and wrote an article about them. After the war Jack worked as a Brickmaker for the Punchbowl Brick Company along with his brothers Nichie (Ernest), Jimmy (James) and Alfie (Albert). He was a keen punter on the horses, but not silly enough to do all his money. Jack had a win in the lottery and with some of the winnings he purchased the headstone for Pop and Nanna Neal at Rookwood cemetery. Jack was the last of his siblings to pass away and died on 24th February 2005 aged 86. Jack Neal, 12th child of Stewart Neal and Marie (Mary) Bottcher. Jack Neal and Dulcie Neal (nee Anderson) at a special occasion. [S28] Bottcher Family History, Harvey and Gabriella Burcher (Reliability: 3), 22 Aug 2007. [S456] The Daily Telegraph Newspaper, Sydney, New South Wales, Australia (Reliability: 3), 25 Feb 2005. See attached death/funeral notice published in the Daily Telegraph newspaper, Sydney, New South Wales, Australia, 25 Feb 2005.